When an older adult begins exhibiting symptoms of cognitive impairment, they may receive an incorrect Alzheimer’s diagnosis. In reality, there are many treatable medical conditions that can cause similar symptoms. Following are several diseases that Oshkosh Alzheimer’s caregivers should get their loved one’s tested for. Some seniors fail to consume an adequate amount of fluids. This is especially true if they are taking a diuretic or drink an excessive amount of caffeinated beverages. Over time, cells and organs become starved for fluid. When the brain becomes affected, cognitive problems emerge. Untreated respiratory, skin or urinary tract infections can all have cumulative effects that affect cognitive ability. Without a proper diet, blood sugar levels may drop dangerously low. In this case, seniors commonly display a wide range of out of the normal symptoms including aggression, confusion, inappropriate behavior or other dementia-like traits. Various OTC or prescription medications produce adverse effects that include confusion or other cognitive symptoms. Sometimes, more than one medication may interact with another and cause undesirable effects. The problem may also occur if patients receive care and prescriptions from more than one physician. Live-in Oshkosh caregivers need to consult doctors to insure drug interactions won’t cause these symptoms among their loved ones. A lack of restful sleep combined with the oxygen deficits caused by apnea can cause a long list of symptoms ranging from general fatigue and memory loss to cognitive impairment and mood disorders. 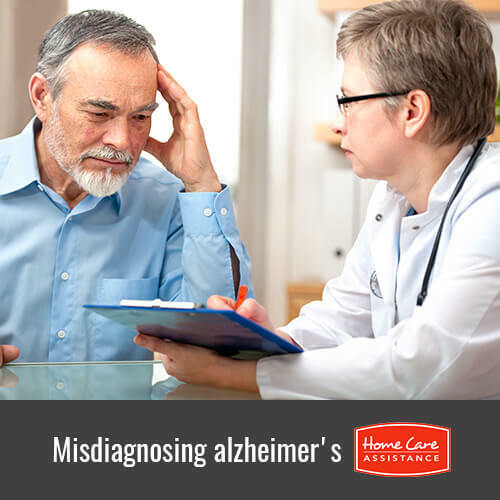 If you currently care for a senior who has been diagnosed with Alzheimer’s, it’s important to get a second opinion. It will also help to hire a trusted Oshkosh, WI, home care provider like Home Care Assistance. As the leading provider of Alzheimer’s and dementia care, we strive to help seniors age in place without compromising their independence. Contact us at (920) 710-2273 today to learn more about our cognitive care and how it benefits our clients.